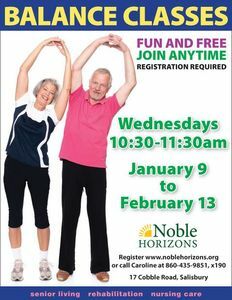 Noble Horizons' free fall prevention and balance series will begin Wednesday, January 9 and run weekly for six weeks through February 13. The classes are 10:30-11:30 a.m. in the Community Room and run for six weeks; they may be joined at any time, although registration is necessary. The classes will help improve balance, increase agility and develop muscle tone. More information and registration is at 860-435-9851, ext. 190 or www.noblehorizons.org; Noble Horizons is located at 17 Cobble Road in Salisbury.